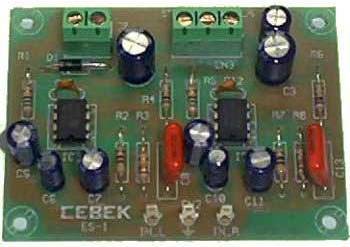 Cebek ES-1 module is a stereo power stage, with a maximum power of 1.8 W per channel RMS. at 4 ohms. It can be connected to the output of a mixer, or auxiliary inputs, pre-amplifiers It includes protection against short-circuits, polarity inversion and connection terminals.